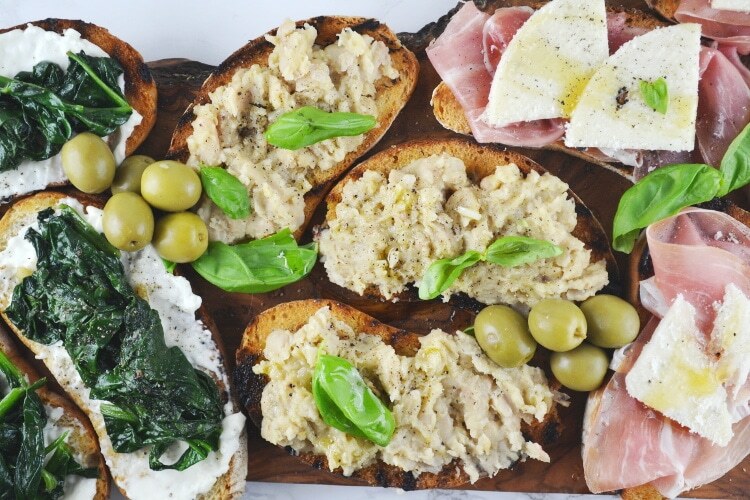 Crostini Three Ways – Stracchino and spinach, garlic and cannellini bean and Prosciutto, Pecorino cheese with truffles drizzled in honey. 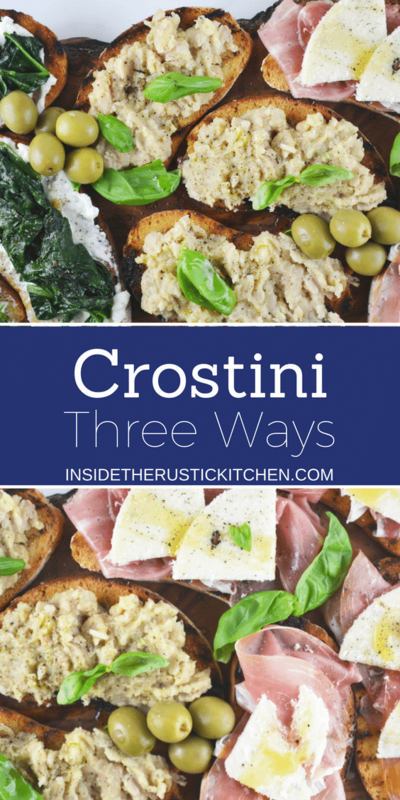 These three easy crostini are they perfect party food. Crostini are an Italian appetizer that consists of grilled toasted bread, normally ciabatta topped with an array of meats, cheeses or vegetables. They are the perfect way to start off an evening whilst sipping a glass of Prosecco. I love making Crostini because they are so easy to make and are so versatile, you can top them with whatever you want. Whenever me and my boyfriend Nathan are in the centre of Siena strolling along the shops and narrow windy streets we often stop for an apertivio (an Italian aperitif). 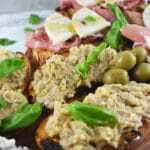 This normally consists of a delicious glass of Aperol Spritz or Prosecco and Crostini topped with meats, paté and vegeatbles. The first type of crostini I made was stracchino and spinach. Stracchino, prounouced stra-kee-no is an Italian cow’s milk cheese from the north of Italy. It’s very soft and creamy in texture and has a very delicious and tangy flavour. to make the crostini, I spread each toasted slice of bread with stracchino cheese. Then I wilted some spinach in a pan with garlic and a little oil, salt and pepper. I squeezed over a little lemon juice and let it cool slightly before adding a spoonful on top of each slice. This is so simple yet utterly delicious. The second topping is canellini bean, garlic and lemon. This one is so moreish and comforting and takes seconds to make. Simply fry a clove of garlic in a small frying pan for a couple seconds. Add the drained and rinsed canellini beans and start to mash them with a fork, add the lemon rind, salt, pepper and oil and mash it all together. Serve warm on grilled toasted bread with a sprinkling of basil. Delicious. I also love to have cannellini mash like this as a side to meat dished such as pork steaks or chicken, it’s a wonderful speedy substitute for mash potatoes and is just as comforting. OK one more to go and it’s my favourite…. Prosciutto, Pecorino cheese with truffles and honey drizzle. Oh yes this one is my absolute favourite and you’re gonna love it too! There’s no cooking involved for this one so it’s super simple the key is to have the best quality ingredients you can get your hands on. Firstly the Prosciutto has to be good quality, it’s very important otherwise it just won’t taste as good. If you can get Tuscan Prosciutto Crudo freshly cut from an Italian deli instead of pre-packaged it would be ideal. Secondly the cheese, oh the cheese! This Pecorino cheese has pieces of black truffle all the way through it and the flavour is incredible! It’s very common to find in the supermarkets here in Italy but a good Italian deli should have it. If not, use normal Percorino cheese and top it with a tiny, tiny drop of truffle oil. YUM. 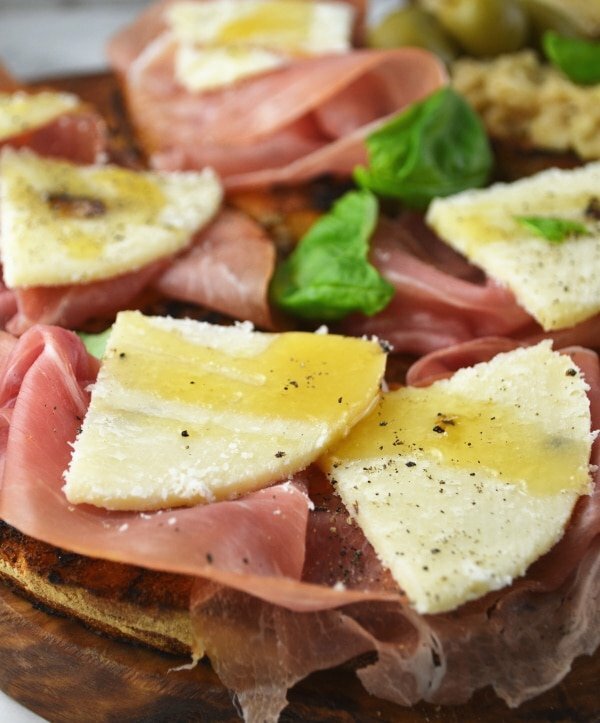 I simply top each grilled bread slice with a layer of Prosciutto followed by the Pecorino and then drizzle it with some beautiful runny honey. And your mouth begins to water. Now let’s get to the recipe shall we? Don’t forget to leave me a comment if you’ve tried any of my recipes and you can always save this one for later on Pinterest below. Crostini Three Ways - Stracchino and spinach, garlic and cannellini bean and Prosciutto, Pecorino cheese with truffles drizzled in honey. These three easy crostini are they perfect party food. Put a griddle pan on a high heat. Cut the ciabatta into 18 slices and drizzle each side of bread with the 1 tbsp of olive oil. Place on the griddle pan until toasted and slightly charred on each side ( do this in batcheset aside on a chopping board or large plate. To make the stracchino and spinach crostini put a medium sized pan on a medium heat with 1 tbsp of oil. Finely chop the garlic clove and add to the pan, fry for 30 seconds. Roughly chop the spinach and add to the pan, add 1tbsp of water if it sticks this will help it wilt. Once the spinach is wilted sprinkle with salt and pepper and a squeeze of lemon juice and set aside to cool. 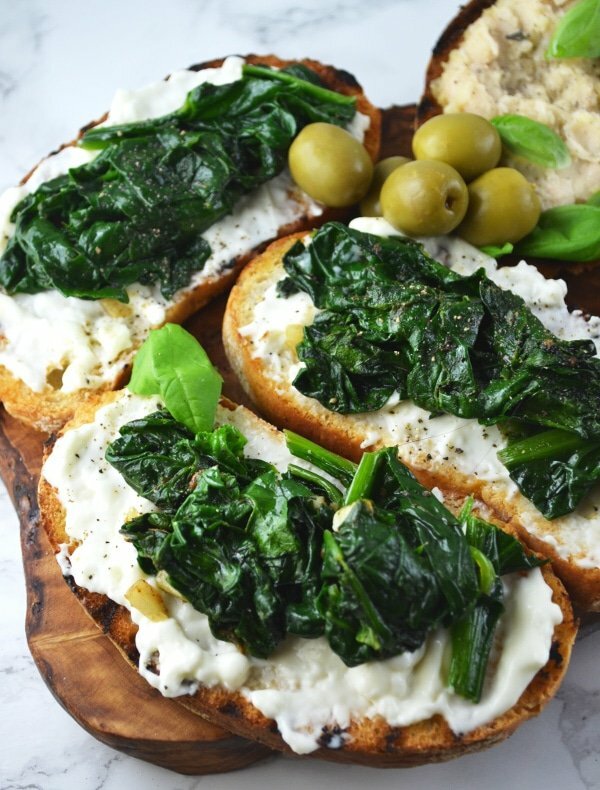 Spread 6 slices of toasted bread generously with stracchino cheese then top with spinach. 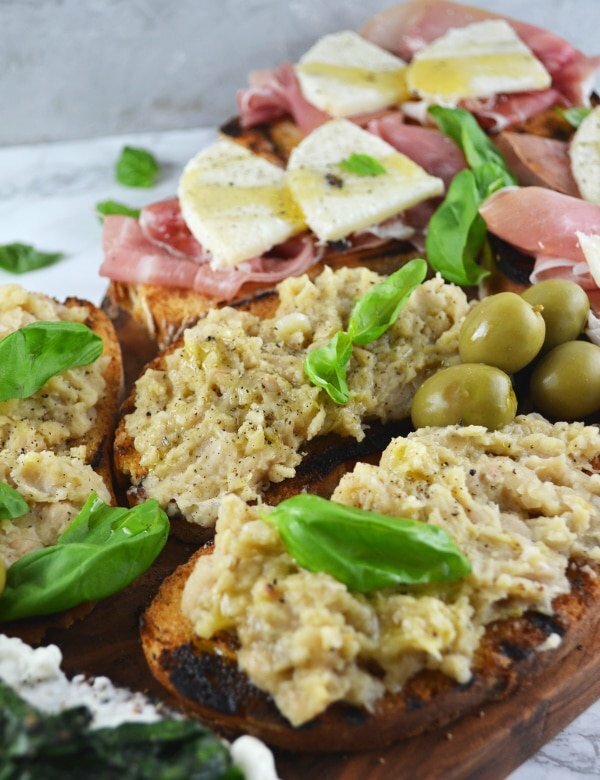 For the cannellini bean Crostini add 1 tbsp of olive oil to a pan under a low heat. Finely chop the garlic and add to the pan, fry for 1 minute. Add the cannellini beans and start to roughly mash them with a fork. Add the lemon zest, salt and pepper and remove from the heat. Add another tbsp of oil and mash everything together, spread on 6 slices of toasted bread topped with a little basil. For the last Crostini simply top 6 slices of toasted bread with Prosciutto, cheese and drizzle over some honey, sprinkle with pepper. Mouth watering indeed! Can’t wait to try these! But simply must try the prosciutto and truffle pecorino first! Yum! It’s my favourite one, thank you! pour a glass of wine and pass that platter! Oh smashed avocado is delicious! Thanks so much Bintu! Such a fun party idea! I love having a variety of options, though I think the bean one sounds to die for! Thank you so much, the bean one is so yummy! Great ideas for holiday groups or game days! Thinks for these very appetizing ideas. Yes these are party perfect. I love serving this when you have a crowd to feed. Easy to make and they disappear in a flash!! They sure do go fast! First of all, gorgeous photos! But also love the recipes and ideas that you provided. I love beans but never even thought of serving white bean mash as a side – genius! Thank you! Fabulous assortment. Quality ingredients do make a difference! They definitely do. Thank you Amanda! This really is the perfect party food and it wouldn’t last long in our house around our friends. YUM!